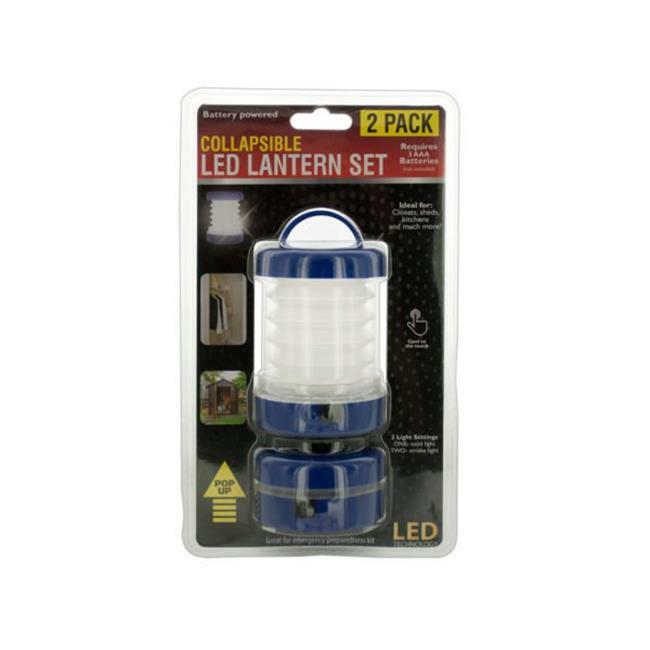 Great for camping and keeping in your emergency preparedness kit, this 2-piece Collapsible LED Lantern Set features durable, compact plastic lanterns in a pop-up design with folding handles for portability. Lanterns have 2 settings solid light and strobe light and are cool to the touch. Operates with soft touch on/off button. Lanterns measure approximately 1.5 tall when closed and 3.75 tall when extended not including handle with a 2.75 diameter. Comes in assorted colors red, blue and green. Lights require 3 batteries not included. Comes d in a ber pack.